I modeled my incentive after a 22 day wellness challenge that I recently completed that was super motivating for me to jumpstart my efforts to live a more healthy well-balanced life. I was amazed at how motivating the simple tool of daily tracking was for me to boost my discipline. And I have to admit that a little competition really works wonders for me! As the results are coming in, I'm seeing that it is a great motivator for some of my students as well. Following is a snapshot of the tracking sheet. Record your points for each task you complete during practice at home. 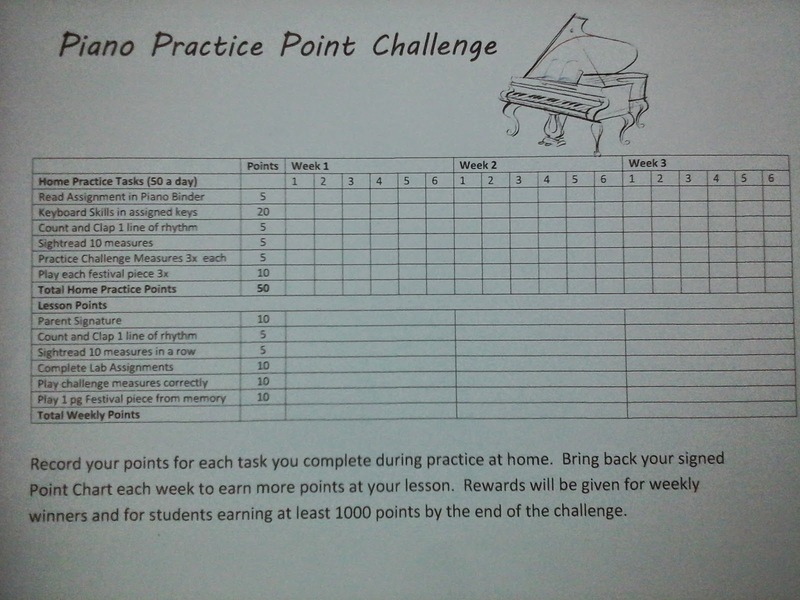 Bring back your signed Point Chart each week to earn more points at your lesson. Rewards will be given for weekly winners and for students earning at least 1000 points by the end of the challenge. Assignment: Reading their assignment each week should be obvious, but I find that too many students don't even read the specific practice notes I write during lessons, so this was an "easy" way for them to earn points and get in the habit. Keyboard Skills: I use the general order of the Music Progressions Keyboard Skills (Scales, Chords, Arpeggios, etc.) each year with my students. I allowed them to earn a lot of points here because it tends to be the least favorite part of practice that they tend to want to skip. Rhythm: Two great resources for Rhythm Samples are Compose Create and Pianimation Rhythm Challenge Sets. Sightread: I've been sending each student home with supplementary books from my music library that are one level below their current lesson book material. Challenge Spots: At lessons I use highlighter tape to stick over 3 or 4 spots in their music that need extra attention. I found that as I guided my own children throughout the week using this point chart, their practice was much more focused and effective since they couldn't track points for just gliding over the familiar favorite parts of pieces already mastered.